There is no one like God. He transcends all that He has made. He is more majestic than the great mountain peaks that rise above the ground; He is more lovely than the beautiful flowers that bloom along the countryside; He is more awesome than the sun as it sets in all its brilliance; He is more diverse than all the trees that fill the forests, that bear fruit in their season, and that shade the landscapes of every country path and village square. God's character is the foundation that you build your life upon, the rock that your feet stand upon, and the strong tower that your faith leans upon. God is completely dependable, unshakable, unmovable, and totally reliable. What does your faith in God's character mean to you today? It means that you know the sun still shines even through there are dark clouds overhead; that the anchor of your soul still holds even though the storm rages on; that your next step is certain even thought a heavy fog covers your pathway; that comfort will be your portion even though you are facing a dark valley; that a strong hand is holding yours even though there is nothing to hang on to as you walk near the mountain's edge. Today is in God's hand, and so are you. His hands are strong and they will uphold you; His hands are great and they will enfold you; His hands are gentle and they will embrace you; His hands are protective and they will cover you; His hands are powerful and they will defend you; His hands are compassionate and they will care for you. 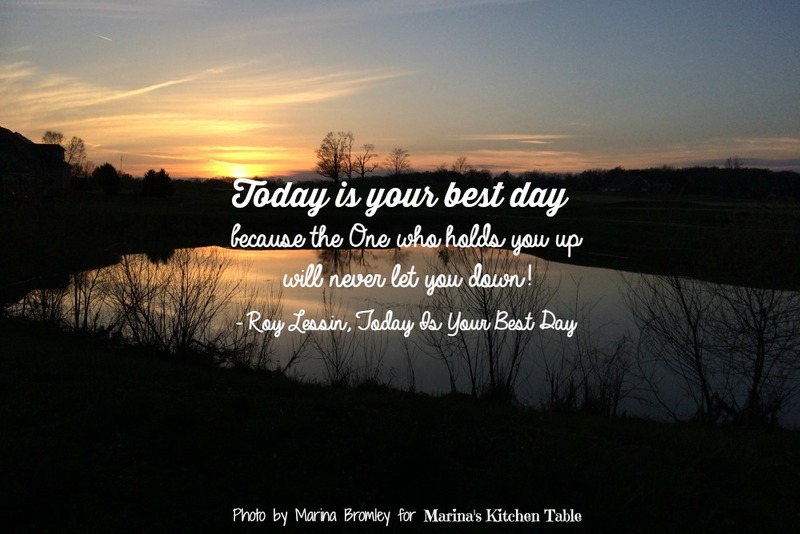 Today is your best day because the One who holds you up will never let you down!